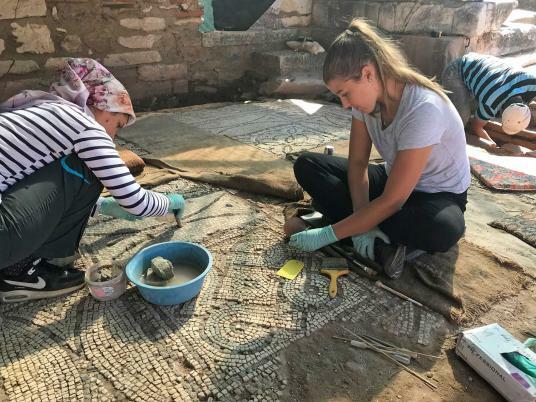 Harvard undergraduate Maria Boyle ’20 (right) and Sevinç Akça conserve an ancient Roman mosaic at Sardis, the archaeological site in western Turkey. This event was recorded. Please view the lecture here. Since its founding in 1958 by Harvard and Cornell Universities, the Archaeological Exploration of Sardis has excavated, conserved, and published on aspects of the ancient city of Sardis in western Turkey from prehistoric through Islamic periods. The expedition is one of the longest running international projects sponsored at Harvard and is one of the oldest classical archaeological projects in the Mediterranean. Harvard students who participate in the program gain academic, professional, and cultural experience while contributing to archaeological research, conservation efforts, presentations, and publications related to the site. As part of Worldwide Week at Harvard 2018, this event brings together the museums staff and Harvard faculty and students involved in the project to discuss their work and to illuminate how team members from various fields and institutions around the world collaborate to advance research about Sardis. The lecture will take place in Menschel Hall, Lower Level. Please enter the museums via the entrance on Broadway. Doors will open at 2:30pm. Free admission, but seating is limited and available on a first-come, first-served basis. The excavation at Sardis is conducted with the permission and support of the Ministry of Culture and Tourism of the Republic of Turkey. Current conservation work at Sardis is also supported by an award provided by the United States Government, Department of State, U.S. Embassy Ankara. Worldwide Week at Harvard 2018 (October 22–26, 2018) showcases the remarkable breadth of Harvard’s global engagement. During Worldwide Week, Harvard schools, research centers, departments, and student organizations host academic and cultural events with global or international themes.